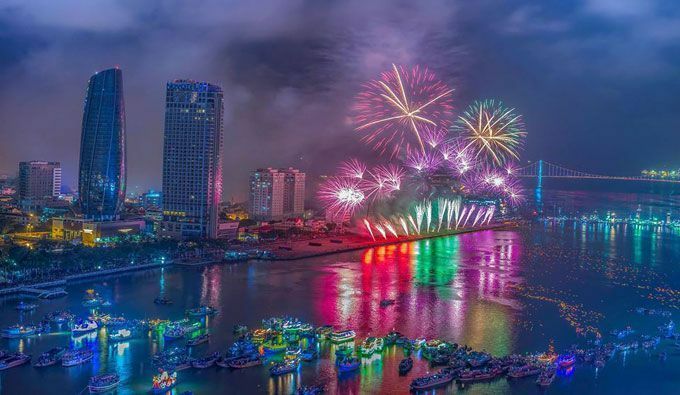 Da Nang International Fireworks Festival 2017, formerly called the Da Nang International Fireworks Competition, will be held for the first time from 30 April to 24 June 2017. The festival with the theme “Shining Marble Mountains” is expected to attract about two million visitors to Da Nang, Vietnam. The festival has the participation of eight pyrotechnic teams from the world’s leading countries for fireworks such as Australia, Switzerland, Austria, United Kingdom, Japan, China, Italy and Viet Nam. Start on 29 April 2017 and end on 24 June 2017 in 5 nights represented for 5 elements of Universes, also the names of 5 peaks of Marble Mountains – the symbol and an tourism attraction of Da Nang city. Besides, a series of activities including international food festival, carnival-style atmosphere throughout the city will be held during the festival. Da Nang is a major port city in Vietnam, and the third largest of all cities in the country. It’s a beautiful place to spend time either if you’re holidaying there or travelling through Vietnam or the wider South East Asia region, and is within 100km of several stunning UNESCO World Heritage Sites. See the hotel prices in Da Nang. Tickets for the festival are on sale in Ha Noi, Da Nang, Ho Chi Minh City, Quang Ninh and Lao Cai with the price from 300,000 - 500,000VND.